A simple alteration to recreational crab pots could save thousands of crabs from going to waste each year, all because crabs are unable to escape from lost crab pots that keep on working, according to a new study. Paul Rudell of Natural Resources Consultants, left, and Jason Morgan of Northwest Straits Foundation place crabs into a trap to test the escape system. 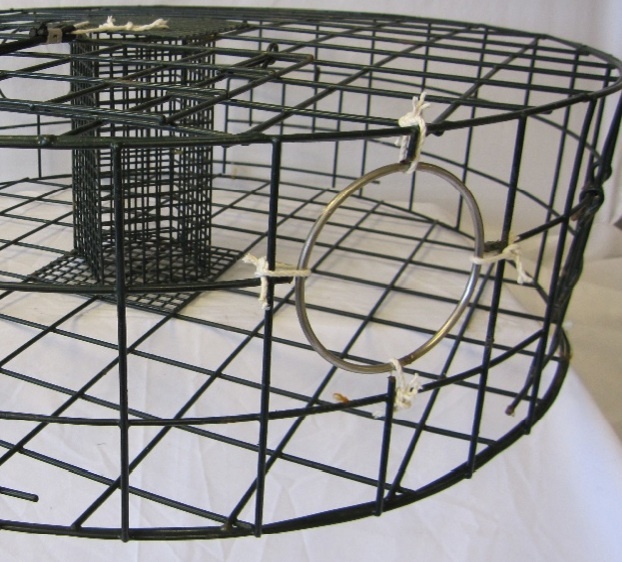 The Crab Pot Escapement Study, commissioned by the Northwest Straits Foundation, is the first to measure how well crabs use the escape routes provided in the design of every crab pot sold in Washington state. The findings were somewhat of a surprise, according to Jason Morgan of the Northwest Straits Foundation. Jason told me that he is eager to get the information out to recreational crabbers, who could voluntarily take steps to reduce crab mortality. The findings might even lead to revised regulations for crab pots. Of course, the best thing that crabbers can do is to avoid losing their pots in the first place. For tips, check out the brochure from the Washington Department of Fish and Wildlife (PDF 2.9 mb) or the Northwest Straits website. About 12,000 crab pots are lost each year in Puget Sound, representing the wasteful deaths of nearly 200,000 crabs, according to a revised estimate derived from the new study. The study, in partnership with Natural Resources Consultants, placed live Dungeness crabs into six common types of crab pots, using 13 various configurations. After the seventh day, the biodegradable escape cord (“rot cord”) was severed to provide an opening through which the crabs could escape — at least in theory. The researchers then measured the time it took for the crabs to get out, if they could. An escape ring tied with escape cord allows crabs a safe exit. One thing the researchers learned was that crab pots with hinged doors tended to keep the crabs trapped, especially when the door was located away from the edge of the pot. The doors simply stayed closed after the escape cord broke free. A modification of the doors with a bungee cord significantly increased the number of crabs that could escape. The doors were modified to spring open when the escape cord broke. The best configuration of all involved the use of escape rings — a circular opening at least 4.25 inches across. These rings are required by law in all crab pots to allow females and under-sized males to get away before the pot is brought to the surface or in the event that it becomes derelict. Many crab pots sold today tie the rings into the crab pot with escape cord. When the cord breaks, the ring falls away to provide a larger opening for the crabs to get out. In some crab pots, the required rings are welded into place on the iron cage. It would be easy enough for people to cut the rings out with a strong pair of wire cutters and then tie them back in with escape cord, Jason said. Manufacturers of crab pots have become interested in the study, Jason told me, and he expects some will quickly convert to tying the rings in place rather than welding them. The difference in cost, if any, should be small, he said, and drawbacks seem minimal. Requiring this method of escape for future crab pots sold in Washington could be another result of the study, but nothing is proposed at this time, Jason said. The next round of studies is likely to look at commercial crab pots, which are generally larger but still require an escape route in case they become lost. A related issue that needs attention is the escape cord, which is made of cotton and designed to deteriorate in a reasonable period of time when left in saltwater. Cords that last longer are likely to cause more crabs to die. Studies have shown that approved escape cord takes between 30 and 148 days to disintegrate, with most people selecting larger cord that can last toward the longer end of that range. A smaller cord would break sooner and allow more crabs to survive when a crab pot is lost, though it would require crabbers to change the cord more often. That would seem to be a small inconvenience to avoid the kind of waste often seen in photos of derelict crab pots filled with dead and dying crabs. Even longtime experienced crabbers can lose a pot now and then, Jason said. Northwest Straits Foundation is working on one or more videos to help people see the benefits of providing escape for crabs and to demonstrate how to modify their crab pots. According to the study, the right modifications to crab pots could allow 99 percent of the crabs to get free when a crab pot is lost in the depths of Puget Sound. More than 466,000 animals — from seals to sea birds to salmon to crabs — were found dead during the retrieval of “ghost nets” over the past 12 years by the Northwest Straits Foundation, which celebrated a major milestone today. In recognizing the end of a significant program, I’d like to add a little personal history. The celebration in Everett marks the completion of the intense effort to retrieve nets lost from fishing boats in less than 105 feet of water — because the vast majority of the nets have been removed. Future roundups may be planned if more nets are found or reported by commercial fishers, who are now required to report lost gear. The removal program has pulled out more than 5,660 derelict fishing nets and more than 3,800 crab and shrimp pots blamed for killing all those marine mammals, birds, fish and other creatures, according to statistics kept by the organization. Northwest Straits Foundation stepped up and tackled the huge ghost-net-removal project with the first grant from the Washington Legislature in 2002. Through the years, other funding came from the federal government, foundations, fishing groups, tribes, corporations and private individuals. In a separate project, U.S. Navy divers removed derelict nets from selected underwater locations. I’d like to add some personal notes, giving a bit of early credit to Ray Frederick, who headed up the Kitsap Poggie Club in 2000, when Ray first called my attention to the ghost net problem. It was right after a state initiative to ban non-Indian gillnets failed at the ballot box, leaving many sport fishermen upset with what they viewed as the indiscriminate killing of fish, including salmon listed as threatened under the Endangered Species Act. 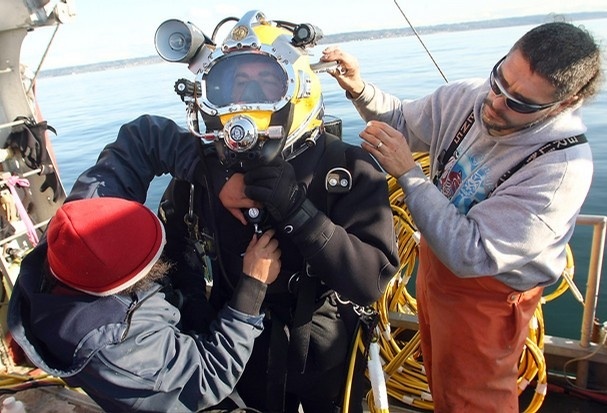 “In the murky, undersea twilight of Puget Sound, scuba divers occasionally come face to face with the tangled remains of rotting fish. Nearly invisible in the dim light, long-lost fishing nets continue to ensnare fish, birds, seals, crabs and other creatures that happen along. I reported that a few net-retrieval operations had been conducted since 1986, but state officials were warning against any ad hoc operations following the death of a volunteer scuba diver, who became tangled in fishing gear and ran out of air. 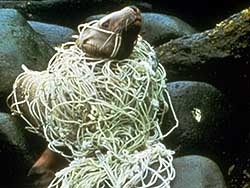 Ray got involved in a campaign to seek state and federal funding to eliminate ghost nets. He wrote to Gov. Gary Locke and select legislators. I located one of Ray’s letters, which expressed frustration about the lack of action to remove the derelict gear he knew was killing sea life in Puget Sound. State Sen, Karen Fraser, D-Lacey, who had been pushing for funding, was joined by then-Rep. Phil Rockefeller, D-Bainbridge Island, the late-Sen. Bob Oke, R-Port Orchard, and other legislators to push through funding to develop new guidelines to safely remove derelict gear. The Northwest Straits Commission, which wanted to remove ghost nets in and around the San Juan Islands, was chosen to conduct the study, which led to “Derelict Fishing Gear Removal Guidelines” (PDF 2.3 mb). Now that most of the nets have been removed in water less than 105 feet deep, the effort must turn to removing nets in deeper water, where they are likely to snare threatened and endangered rockfish species in Puget Sound. 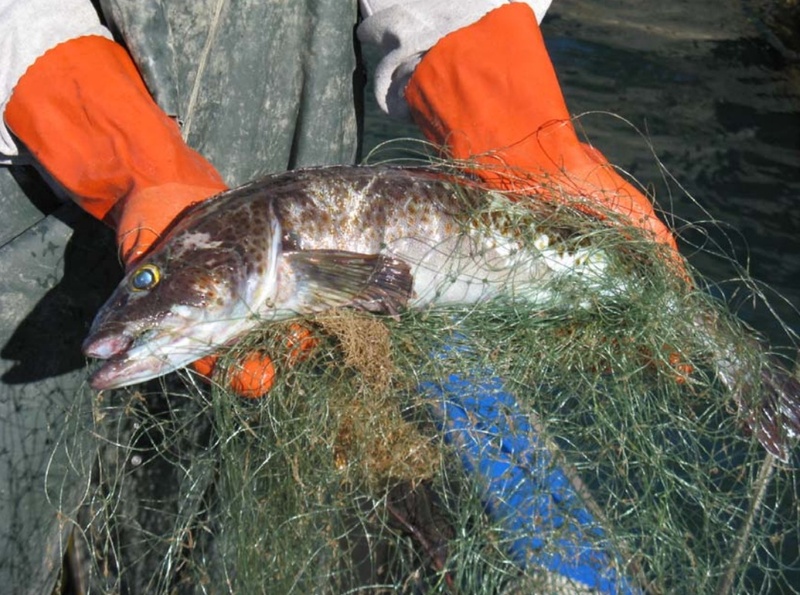 NOAA Fisheries and the Washington Department of Fish and Wildlife have listed abandoned nets as threats to rockfish and recommend action. The most promising method of removal is remotely operated vehicles. A report by Natural Resources Consultants (PDF 1.4 mb) spells out the various options. It seems like $4.6 million is a lot of money for removing abandoned fishing nets from the waters of Puget Sound. But I bet most people would agree that it would be great to get rid of 90 percent of the nets still submerged and killing marine life. Twila Dawn Captain Steve Sigo (right) and First Mate Aaron Leschi (left) help diver Jake Johnston suit up for his dive at Apple Tree Cove near Kingston on Thursday, when the crew brought up an abandoned fishing net. Kitsap Sun reporter Tara Garcia Mathewson was on a boat Thursday, watching divers bring up a net in Apple Tree Cove near Kingston. See the story she wrote for today’s Kitsap Sun as well as a video. Ray Frederick of Kitsap Poggie Club first informed me about “ghost nets” more than a decade ago. At the time, officials were just becoming aware about how much damage the nets can do. But, when it came to money, it wasn’t a high priority. State officials were reluctant to allow volunteers to do much, in part because they worried about people’s safety, or so they said. There also seemed to be a concern about using robotic equipment to yank up the nets, because it could harm sea life and undersea habitat where the nets were wrapped around rocks. Now, with federal stimulus dollars, professional divers are on the job with a goal of removing 3,000 nets before the end of next year. If I’ve done the math correctly, we’re talking about a little more than $1,500 for each net. For perspective on the history, see stories I wrote for the Kitsap Sun in May of 2000 and in June of 2002.